The severe winds and copious rainfall have certainly had dramatic effects on many gardens in the hills. The strong winds have blown over many shrubs and trees as the very wet soil has loosened the roots. Any shrubs or small trees that have been pushed to one side should be firmly staked and the foliage trimmed back to make the plant more stable. Old stockings are excellent for tying plants as they do not cut into the bark of the staked plants and have great elasticity. 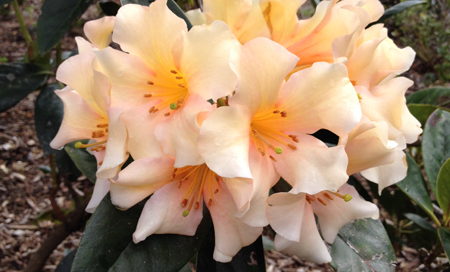 Stagnant water can be fatal to Rhodos, so after these very wet conditions ensure that no plants are sitting in water. Apart from draining any excess water away by using furrows or pipes, it is often possible to lift smaller plants (using a fork or spade) to a level above the water. Where the soil is clayey or badly drained, a good idea is to make raised beds containing friable soil and mulch. To read more of this and other interesting articles see the newsletter!